Where I Am Now: Were Sewer Breaks on Wickstrom Place Caused by Development? 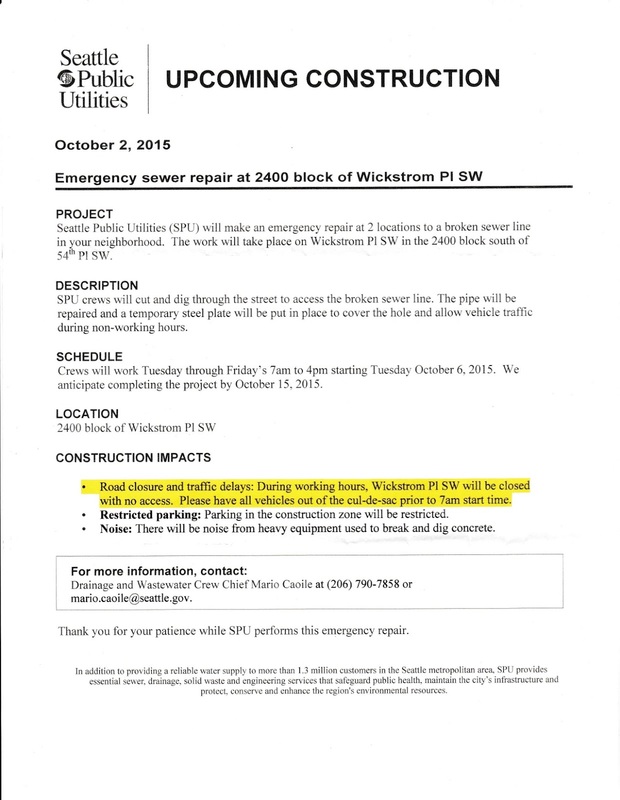 Were Sewer Breaks on Wickstrom Place Caused by Development? During the weeks of controversy over the permitting of the Alki 11 rowhouses that now face 55th Ave SW and Wickstrom Place SW at Alki Beach, it was pointed out to the city that this project would present sewer problems. For one thing, dumping over one MILLION gallons of extra waste water into the 100 year old sewer line on Wickstrom without any infrastructure upgrade made no sense. Neighbors opposing the project also raised concerns about possible flooding and sewage overflows. But the City ignored these concerns. Permits were issued without requiring the developer to do anything to upgrade the sewer line. The Alki 11 and another 3-unit rowhouse project across the street from it on Wickstrom Place were completed earlier this year. All 14 units are now occupied. And all of their sewage and stormwater go into that 100 year old sewer. 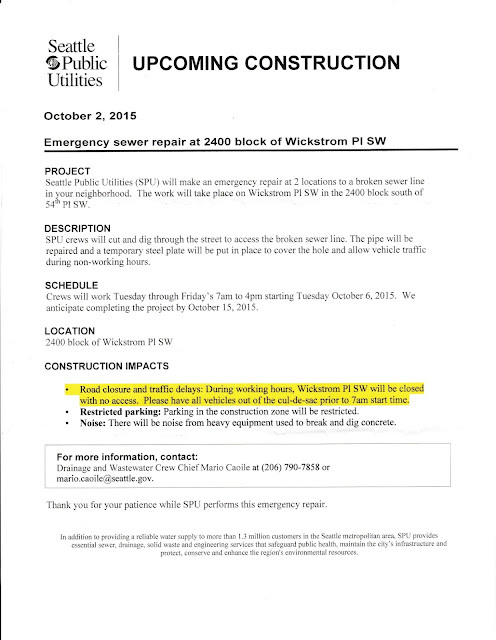 Today, those of us who live on Wickstrom Place received notice that 2 emergency emergency sewer repairs will have to be done on the section of sewer directly in front of the Alki 11 project. Construction will begin Tuesday, October 6. Is it a coincidence that these repairs are needed now that all these units are online? Probably not. I, for one, expected problems. I just didn't think they would show up until we got into the rainy season. Obviously, work on that sewer line would have been necessary sooner or later. But what rankles me is that instead of the developer paying to upgrade the sewer line, as he should have, the cost will now fall on taxpayers. Way to go, DPD.